Okay okay im back from an ace night in nottingham where I must have had like 4 or 5 new beers as well. To business! 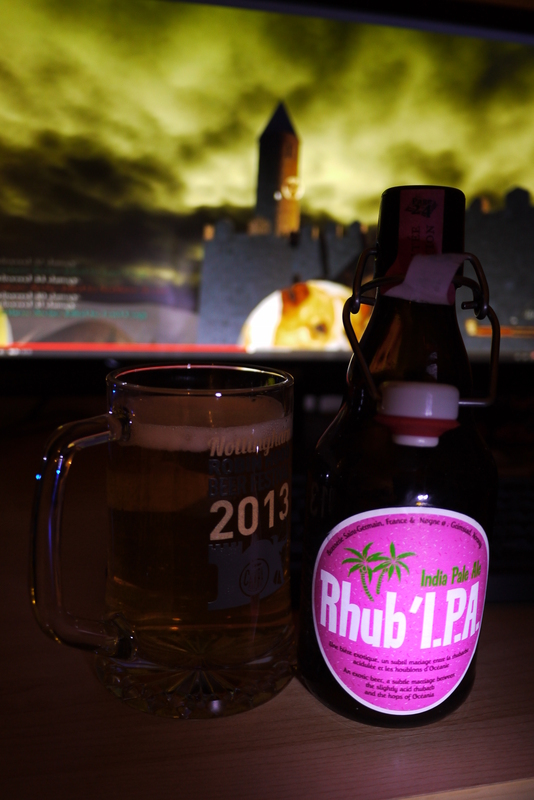 Here we have Rhub’ IPA (Indian Pale Ale) from a collaboration of Saint Germain/Page 24 and oh I don’t believe this…. and Nogne brewery, who made yesterdays amazing drink. Oh boy. Here goes nothing. The aroma is classic indian pale ale with a pleasant tarte rhubarb, you really get both aroma’s equally but that is really all I can smell. The taste is just typical indian pale ale with a hint of rhubarb, thankfully like the aroma it is tarte rather than sour. The carbonation is low so it doesn’t intrude the faintness of the rhubarb and it leaves a clean finish. Deciding wether to be snide or not by mentioning you drink it and then its gone. Overall a very inoffensive drink but also quite boring and forgettable. The only real good thing I will say is that it is refreshing though. Will also mention that the upon opening said bottle I got covered in a rhubarb mist, fact. It also makes me want to try sweeter version of this, maybe not as an ipa anymore either, but it would be interesting.